A Presbyterian farmer and former Fine Gael TD hailed for his work towards cross-border co-operation was described as “big in stature and in heart” at his funeral. Seymour Crawford, who died on Saturday at the age of 74, had been vice-president of the Irish Farmers Association, a Fine Gael TD for the Cavan–Monaghan border constituency from 1992 to 2011, and an elder of the congregation at the Presbyterian Church in Newbliss, Co Monaghan. 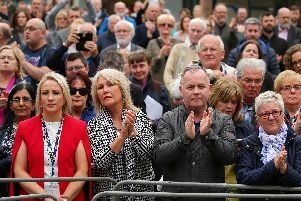 Amongst those to pay tribute following his death were the Irish President Michael D Higgins, who described him as an “early voice for cross-border co-operation”. His funeral was held at Newbliss Presbyterian Church on Tuesday afternoon. Rev David Nesbitt, retired minister of First and Second Ballybay, Rockcorry and Drumkeen Presbyterian churches and father of the Presbytery of Monaghan, delivered a touching eulogy at the service. “Seymour Crawford was a big man – big in stature and in heart, in his interests and commitments, in his generosity as in the impact his life made in various areas of life,” Rev Nesbitt told mourners. “Family was such an important element in Seymour’s life. I well remember his respect for, along with his concern about and care of his late father and mother; and how deeply he felt the illnesses and deaths of his brothers, together with his affection for his nephew, Andrew, who has shared almost the last 30 years of his life.